Here's another simple way to jazz up an apple in your bento lunches. 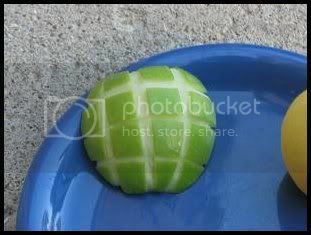 Kidlet loves the turtle shell pattern on a green apple in his lunch so he gladly helped me with this tutorial! 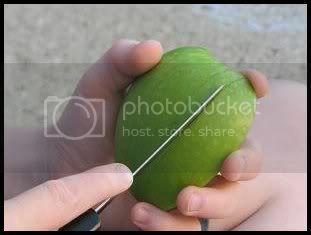 First, make 3 sets of 2 lines, scoring the apple lightly with a sharp knife. 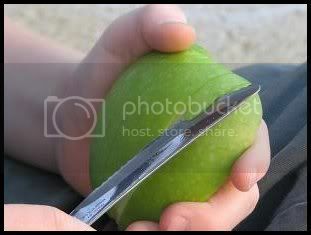 Then use the sharp edge of your knife to remove the skin from the 3 lines you've created. 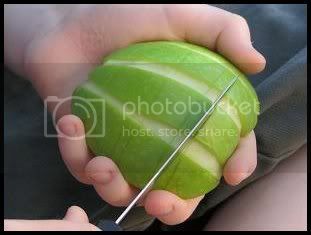 Next you will turn the apple and make 3 sets of 2 lines going the other way on the apple. When you're finished rub the apple with a little lemon to prevent browning and you have a super simple and tasty apple! This is awesome!! Just the kind of tutorial I wanted. Simple and easy. Daughter gave you a thumb up! and me too :) Thanks!! Thank you for sharing out! I love this tutorial. Thanks for linking up!